While attending a dinner a few months ago where my mother received a well-deserved award for her many years of service to our local Boys & Girls Club, a family friend approached and told me of his wife’s incredible salad dressing. “Nancy always has a jar of her special dressing in the fridge and everybody just loves it”, he reported. Note: This dressing has become a regular in our house. A bottle kept on hand facilitates delicious salads in minutes and pairs well with Blueberry and Avocado Salad, Strawberry and Spinach Salad, Fall Salad and Spring Millet Salad. I am also thinking a speedy broccoli salad would be terrific with this dressing. Most recently, my family has been enjoying Nancy’s dressing on this delightful Autumn Salad. Nancy reported that this salad dressing recipe is originally from “Lancaster Entertains”, a cookbook published by the Lancaster Medical Society Auxiliary–at least 50 years ago! It is credited to Evelyn Jones, a friend of Nancy’s mother. Nancy keeps a jar in her fridge, using it as her go-to salad dressing. I find it well suited for a basic spinach and strawberry salad and almost anything with fruit, nuts, and cheese. Moreover, the slight sweetness perfectly balances bitter greens and vegetables such as radishes. Mix all the ingredients in blender until thick and well blended, about a minute. I also mixed a batch with a whisk after mincing the onions very finely. This is a fine option if you do not have a blender. The dressing will keep for several weeks in the refrigerator. However, the recipe may be cut in half, if desired. 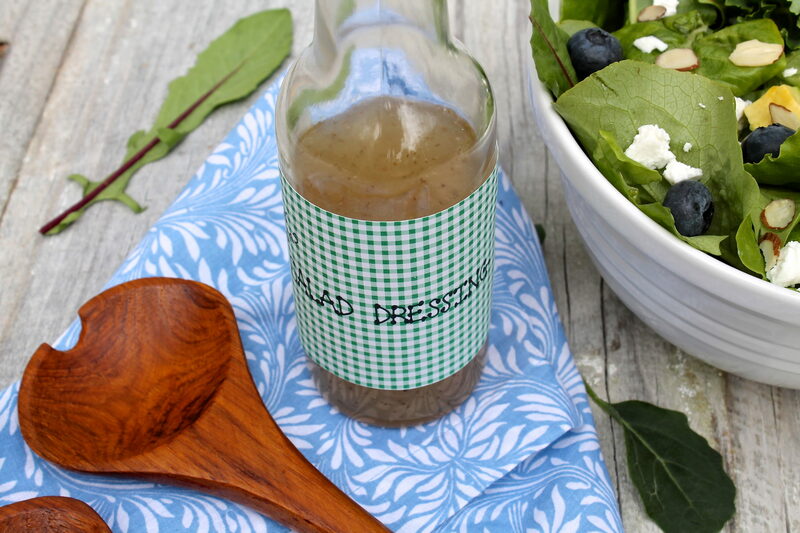 I made this dressing–OH MY GOODNESS! What a treat! I paired it with a spinach and arugula salad, topped with craisins, walnuts, goat cheese, and some fresh scallions I had picked up at the farmer’s market. It was so yummy! That combination would be divine! Thanks for the great comment, Kate! I’ve been eating salads for lunch, so I mixed this up for something different. It is wonderful! So glad you like it, Amie! It is very good. I just made a batch and it fit perfectly into my Good Seasons jar. I think I would like it with just a little less sugar. Next time. Thanks! Thanks for the comment, Cathy, and so glad you like. Good to know it fits in the jar, too! This is a dressing that can absolutely be tweaked to personal tastes! Made the salad you mentioned on Facebook tonight with this dressing and LOVE it! Thank you so much! Very nice and lightly sweety too! Recipes delivered straight to your inbox. By signing up, you will allow us to communicate via email, but I will not share your email with a third party. Copyright 2019, Fountain Avenue Kitchen. All rights reserved.